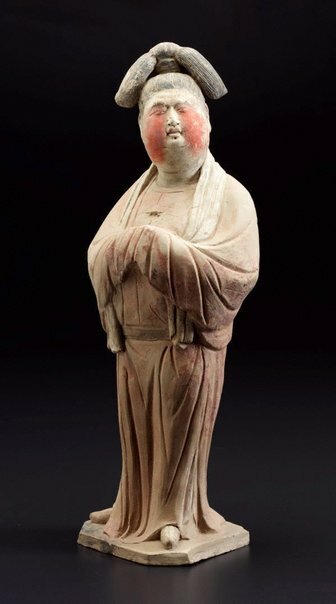 A sizeable court lady stands on an irregular shaped base with head turned to the left and slightly upwards. She wears a large red coloured garment, fastened at the waist by a belt. Her hands, concealed in voluminous sleeves, are raised to chest level in a reserved manner. A long scarf, painted originally in creamy pigment, is draped around her neck. Her black hair is arranged in the style known as 'shuangji' or double-chignon - hair that was stiffly lacquered and drawn up tightly from the scalp, bound in the centre and collapsing in a clump on either side. A crescent-shaped comb is set into the hair at the back. Not only is her hair rendered in graceful realism, so are her small shoes, which represents vividly woven hemp slippers. Her face has plump cheeks decorated with carmine, and a vivid facial expression. The modelling overall is of a high quality and the swaying stance of the figure is well observed and depicted. 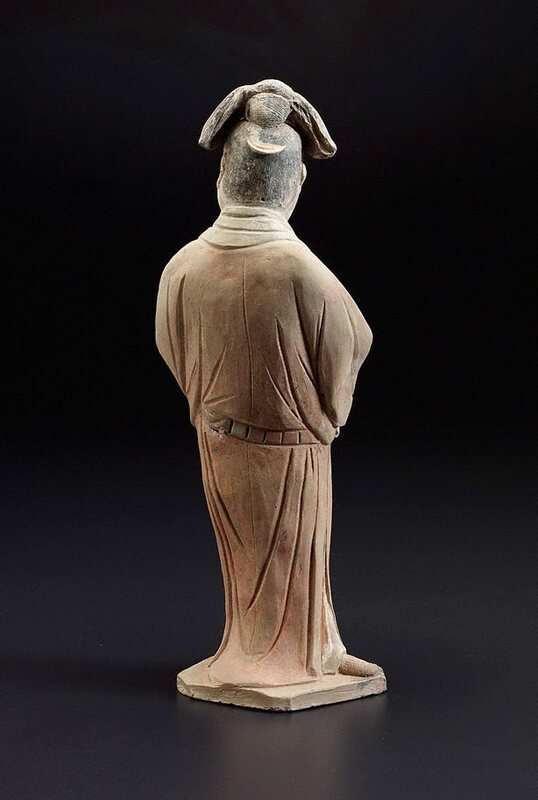 One unusual feature is that, unlike many of the moulded only earthenware figurines, details of this court lady's garment, shoes and head were completed with delicate and decisive carving. 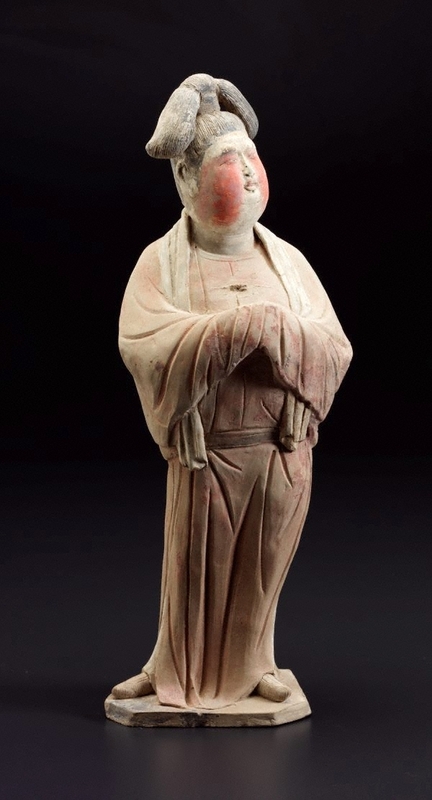 The figure is comparable to a set of 16 earthenware female figurines excavated from an 8th century tomb in Hansenzhai, Xi'an (Xiaoneng Yang, ed., 'The Golden Age of Chinese Archaeology', Washington DC, 1999, entry 173). Smaller but finer in detail, this figure shows more individual characteristics through her subtle facial expression, and the detailed hair and shoe styles.